The Old Testament refers to eggs of birds (Deut. xxii. 6) and of vipers (Isa. lix. 5, A. V., "cockatrice"), and to the well-known fact that the ostrich leaves the egg in the warm sand and allows it to come to maturity through the heat of the sun (Job xxxix. 14). The humane command is given not to take away the dam together with the eggs from the nest (Deut. l.c.). The custom of collecting eggs which had been left in the nest is made use of in the fine imagery of Isaiah (x. 14). According to the Rabbis (Ḥul. 64a), the eggs of birds suitable for eating have one end oblate and the other pointed, and the white surrounds the yolk; whereas with the eggs of impure birds the ends are either both pointed or both oblate, while at times the yolk is outside the white. In the eggs of amphibious animals the yolk and white are intermingled. Impure birds may sit upon and hatch the eggs of pure birds, and vice versa (Ḥul. 138b). The male bird sometimes sits upon the eggs, as in the case of the partridge; according to some authorities both the eggs and the sitter may then be taken, though seemingly in opposition to Deut. xxii. 6 (ib.). The development of the egg proceeds from the chalaza of the oblate end, which is supposed to represent the original seed (Ḥul. 64b)—a mistake opposite to that of Aristotle, who traces the development from the chalaza of the other end. The strength of the shell was known to the Rabbis, who stated that it was used sometimes to support a bedstead (Beẓah 3b). The egg of the ostrich was sometimes used as a vessel (Kel. xvii. 14), and its membrane was used in medicine (Shab. 110b); the hen's egg was used as a liquid measure (Yoma 80a; 'Er. 83), of which 144 went to a seah. For the egg of the phenix see Bar Yokni. 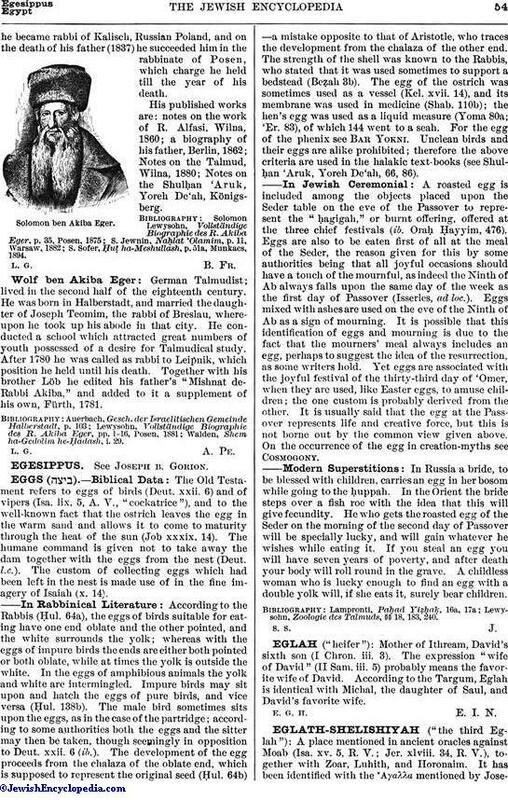 Unclean birds and their eggs are alike prohibited; therefore the above criteria are used in the halakic text-books (see Shulḥan 'Aruk, Yoreh De'ah, 66, 86). A roasted egg is included among the objects placed upon the Seder table on the eve of the Passover to represent the "ḥagigah," or burnt offering, offered at the three chief festivals (ib. Oraḥ Ḥayyim, 476). Eggs are also to be eaten first of all at the meal of the Seder, the reason given for this by some authorities being that all joyful occasions should have a touch of the mournful, as indeed the Ninth of Ab always falls upon the same day of the week as the first day of Passover (Isserles, ad loc.). Eggs mixed with ashes are used on the eve of the Ninth of Ab as a sign of mourning. It is possible that this identification of eggs and mourning is due to the fact that the mourners' meal always includes an egg, perhaps to suggest the idea of the resurrection, as some writers hold. Yet eggs are associated with the joyful festival of the thirty-third day of 'Omer, when they are used, like Easter eggs, to amuse children; the one custom is probably derived from the other. It is usually said that the egg at the Passover represents life and creative force, but this is not borne out by the common view given above. On the occurrence of the egg in creation-myths see Cosmogony. In Russia a bride, to be blessed with children, carries an egg in her bosom while going to the ḥuppah. In the Orient the bride steps over a fish roe with the idea that this will give fecundity. He who gets the roasted egg of the Seder on the morning of the second day of Passover will be specially lucky, and will gain whatever he wishes while eating it. If you steal an egg you will have seven years of poverty, and after death your body will roll round in the grave. A childless woman who is lucky enough to find an egg with a double yolk will, if she eats it, surely bear children. Lewysohn, Zoologie des Talmuds, § 18, 183, 240.